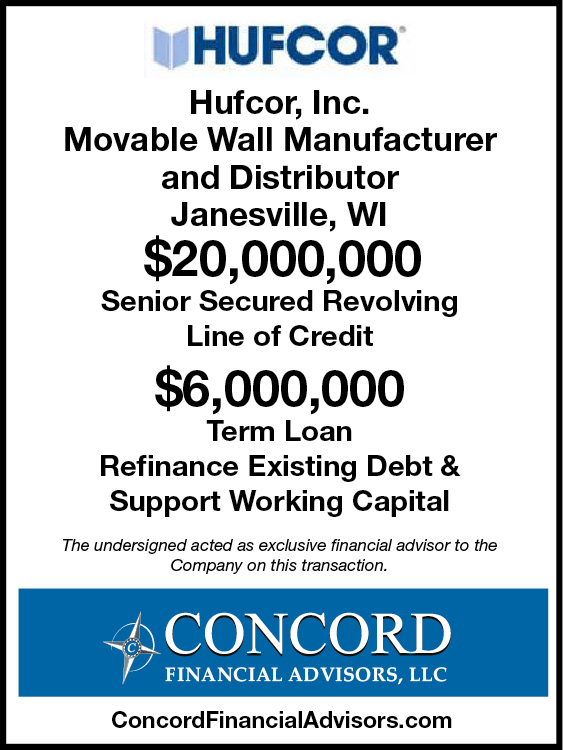 Concord Financial Advisors, LLC announces the closing of a $20MM Senior Secured Revolving Line of Credit and $6MM Term Loan for Hufcor, Inc. (Company) located in Janesville, WI. The Company is a leading, global manufacturer and distributor of movable walls. Concord created a detailed memorandum featuring the Company’s leading global industry position and strong ownership/management team. Concord drew on its 100+ years of collective corporate finance experience and proven debt placement process to identify bank and non-bank financial institutions that were comfortable with the industry and situation. After conducting a targeted search process that generated a variety of Proposals, Concord secured an attractive loan structure from a nationally recognized finance company that met the Company’s financing objectives, including a Senior Secured Revolving Line of Credit and Term Loan, eliminating the need for a Mezzanine Lender.